Menu items are essential in any Joomla installation. Individually they represent a link to a page such as contact, home, about us, blog, etc. It is highly recommended to understand more deeper its importance in order to have more control over the modules and the urls mainly, but is not limited to only that. Continue reading this post to see what it's this about. A menu item is a link to a component; represent a page in your website. Being more general, the menu items allow us to create and manage the site structure and the urls. The most important features are title, alias and type. Menu title. Is the visible name. Alias. Is the string that works as path in the url; doesn’t include spaces. How many menu items can I have? There is no limit in the number of menu items you can create. Actually you can split all your menu items in different menus from Menu > Menu manager for organizational purposes. By default, any new Joomla installation include a Main menu that would become the visible menu for your visitors. You can add more menus to handle "invisible" menu items, providing a comfortable url management based on the alias. Why should I care about menu items? Modules can be linked to menu items. In a practical situation when you want to display a block of content only in specifics pages, the only way to make it happen is by assigning to menu items. 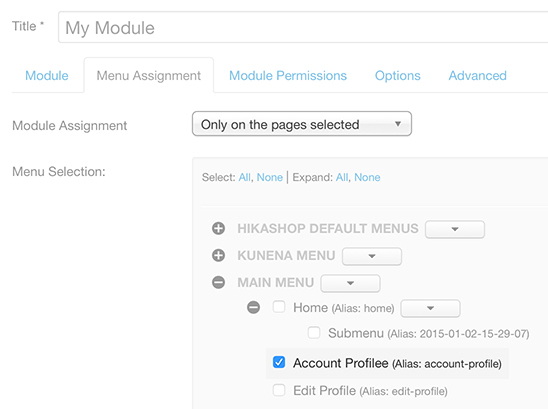 Create pages that will be available for specific users groups such as "Registered". Very useful for sites that sell memberships or access to paid contents. Let’s think in an article that contains our “About us” information. This same behavior apply to other components in general. There are more advantages about using menu items. I shared the ones I personally consider important for general purposes. The more content we have associated to menu items, the more control we have in a website. Read more about menu items in Joomla docs.